22 yr old Tipper is not sure what to do. Her father disappeared long ago leaving Lady Peg, and her, with the care and upkeep their estate, Byrdschopen. Tipper keeps hoping her father will appear as the money is starting to run out and she has had to sell some of sculptures to pay the servants and buy food. Just when she thought things couldn't get worse Tipper's father, Verrin Schope, returns. Sort of. He had been whisked away to a gateway that has become unstable. This unstableness meant that he could disappear again at any moment. Each disappearance/reappearance degraded Schope's health and he needed to find three of his sculptures to stay in this world. Unfortunately, Tipper had not only sold the sculptures, she didn't know who the final recipients were. Tipper, Verrin Schope, and Bec, her parrot guardian set out on a quest to retrieve the sculptures before it's too late. Donita K. Paul introduces us to a world that is not quite different enough to make us forget our own. Couple that with a host of characters and the reader spends a lot of time trying to organize things. This proved to be distracting at times. As this was my first encounter with Paul's work, I'm convinced that being unfamiliar with her writing style was what stopped me from fully immersing myself in The Vanishing Sculptor. Overall I give The Vanishing Sculptor 1 copy. I will purchase it for the school library but I will only booktalk it to specific audiences. 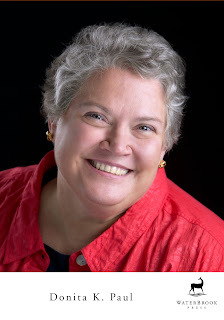 Donita K. Paul is a retired teacher and author of numerous novellas, short stories, and eight novels, including the best-selling DragonKeeper Chronicles, a series which has sold more than a quarter million books to date. The winner of multiple awards, she lives in Colorado Springs , Colorado , where she spends time mentoring and encouraging young writers. Visit her online at donitakpaul.com. You can also find Donita K. Paul on Goodreads. I have ONE copy of this book to giveaway! Just leave a comment and your name will be entered into a drawing! US residences only. The contest will run until July 8th, 11:59 PM, EST! Good luck! Oooo. This looks like a fun fantasy novel. Count me in for the giveaway! This sounds like such a fun read - I would love to win this! please count me in. Hi! There's still time to win The Veil or Tomorrow's Treasure! Thanks for entering! Winner: Carlene! - I will email you.